Hello! Yes, I know what month it is. I am three months, or fifteen cards behind on my Christmas Card Challenge and I am hurrying to play catch-up. Fall was so busy for me that I never had time to get into my craft room to meet my monthly challenge. 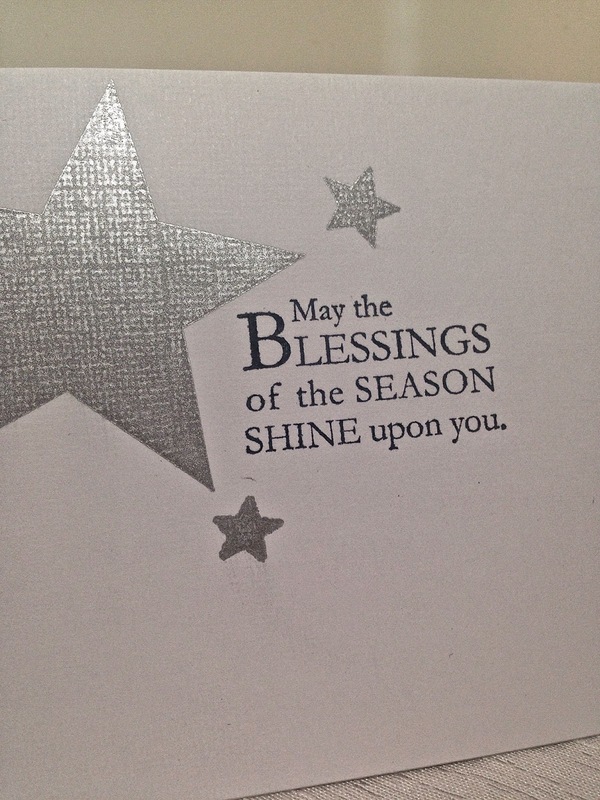 As most of you already know, I play the Christmas Card Challenge at Splitcoaststampers. We make Christmas Cards all year long so that were not stressed out during the busy holiday season (well that worked out well for me didn't it? Surprise! I'm stressed out!). I've committed to making five Christmas Cards a month so that I'll have about sixty cards at the end of the year. I make all my cards 4 x 8 so that I can fit a Christmas Letter and Photo Card inside. I also try to keep my layers minimal so that the cards are easier to mail. Because I'm so far behind and Christmas is only -GASP- sixteen days away, I decided to keep my card super simple and just stamp on the main panel using no layers or embellishment at all. However, it took so long to color the main image, that it was hardly simple. All the images and sentiments are retired Stampin Up!. The main image is from the set 'Baby Jesus is Born' and the sentiment and star is from the the set "Xmas Words 'Star Studded Season'". I used Copic Markers to color the main image and a metallic silver stamp pad to stamp the stars. I just love the images and sentiments in this set. They are so sweet, and the sentiments are so lovely. This is beautiful!! It may be a one layer card but it certainly is NOT a simple card. You did a fabulous job on the coloring of that stamped image. I also like that you did a non traditional sized card too. I laughed when you said you were keeping it simple and nodded when you said 'colouring takes a long time'! I have so been there! Gorgeous, gorgeous bold shades, though and definitely worth the effort. Thanks for joining us at CASology this week! 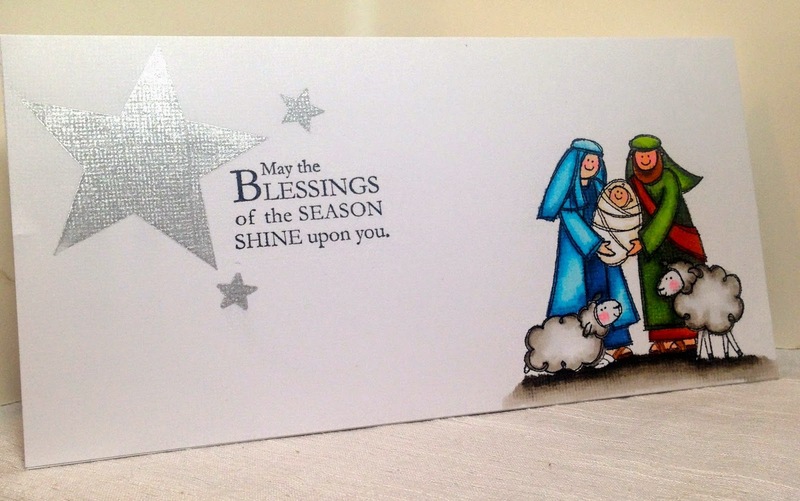 (if you want something simpler, you could just do the left side of the card and leave the colouring for the new year! lol!) Good Luck! Amy, this is stunning, and I so love your coloring! Anyone would be thrilled to find this in their mailbox! Beautiful card! I love the sweet images and your coloring is so pretty. I love the rich colors. Beautifully done! What a beautiful card design Amy. And I really love that stamp and sentiment! Gorgeous Copic colouring Amy! I love this card size! So glad you joined us at CASology this week! What a beautiful card. Noticed it is textured cardstock and after coloring, it looks like it's colored on a piece of canvas. Lovely copic coloring and overall card design. Well, this is just adorable! i LOVE that image and your coloring is fantastic! I also love the textured paper and the cool shape of your card! Thanks for joining us at CASology this week! Very pretty card and great colouring. Thank you so much for joining us at CASology this week.